Confirm Your Info Below To Start Download This download is available only to select Luxury Builders. 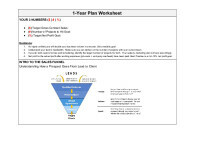 The CLB 1-Year Plan Worksheet is a simple tool to help you think through and document your business plan. The CLB team works with builders nationwide who want a high-performance business. We provide expert advice on generating more qualified referrals, winning more contracts and increasing profitability. Let us know if you want to be the next successful builder working with Certified Luxury Builders Network. CLB offers a 30-Day Experience trial membership with a money-back guarantee. Contact one of our Executive Coaches today and experience how CLB can help you outperform your competition. The CLB Network guarantees real-life examples, simple processes, and timely results. If your download didn't start automatically, click here to restart your download.